This is what happens when you invite top chefs who seek out local and sustainable food for their menus, match them up with farmers who produce the region’s best ingredients, and bring them all together in one place for one great night. You get Localicious, Chicago’s unique, one-of-a-kind party on March 20 that gives food lovers the opportunity to see — and taste — for themselves how their favorite chefs transform Good Food into amazing dishes. And they will be able to pair these delightful bites with some of the Midwest region’s finest adult beverages and soft drinks. Localicious would be one of the year’s most anticipated tasting events on the quality of its offerings alone. 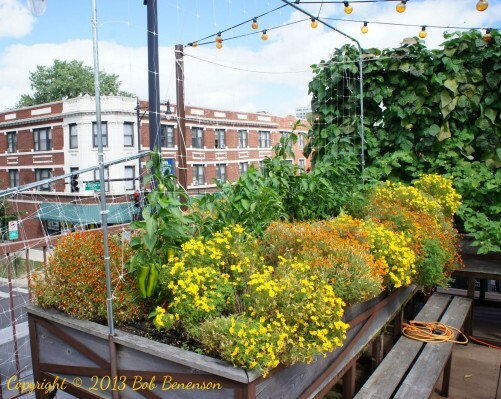 What makes it one of a kind is its focus on local and sustainably produced food and drink. Localicious is, after all, a highlight of FamilyFarmed’s 11th annual Good Food Festival & Conference, the nation’s oldest and biggest trade show, issues forum, and public celebration of the fast-growing Good Food movement. Presented by FamilyFarmed and Local Foods, a Chicago grocer and distributor, Localicious demonstrates how using these practices can result in the highest quality — and most delicious — food that also is produced locally, sustainably, humanely, and fairly. Restaurants and caterers serving their delicious fare at Localicious this year include Big Jones, Browntrout, Duke’s Alehouse & Kitchen, Eastman Egg Company, Farmhouse, Floriole Café, Foodease, Lyfe Kitchen, Nana Organic, Osteria Via Stato, Perennial Virant, The Chicago Diner, The Kitchen, The Radler, Uncommon Ground, Vera, and White Oak Gourmet. Uncommon Ground, a repeat Localicious participant, is famed for the rooftop organic farm at one of its Chicago locations. There will be other great treats on hand from Eli’s Cheesecake, Katherine Anne Confections, Ruth and Phil’s Ice Cream, Seedling Orchards, and Tiny But Mighty Popcorn. The chefs are in the process of crafting menus for Localicious 2015. To get a flavor, though, last year’s samples included braised pasture-raised beef with Bavarian cabbage, cottage cheese spaetzle, beet root, and dill cream from Farmhouse. Uncommon Ground created an heirloom turtle black bean soup with bacon and sour cream. From Browntrout came sous-vide genesis chiaggia beets with sunflower seeds, green shiso, Driftless cheese, and a citrus sunflower vinaigrette. These were just a few of the taste transformations by the chefs. 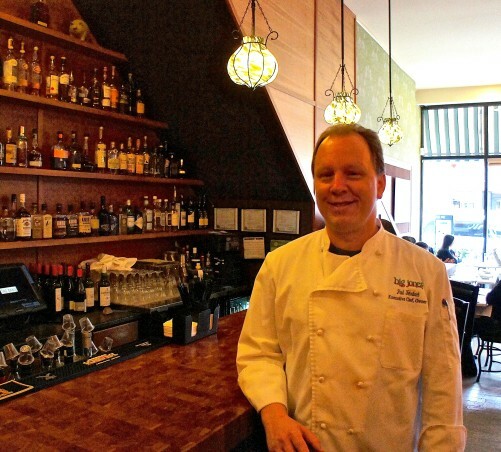 Localicious gives those who love good food the chance to rub elbows with some of the best chefs in Chicago, such as Paul Fehribach, chef-owner of Big Jones — who will be honored with FamilyFarmed’s Good Food Chef of the Year award at the Good Food Festival on Saturday, March 21. Fehribach has built a big following and received critical acclaim for his deeply researched take on traditional Southern cuisine, the subject of The Big Jones Cookbook he has coming out this spring. His interest in all things food is literally granular — he seeks out ancient and heirloom grains for his recipes — and is one of the main reasons Paul enjoys participating in Localicious each year. Koval Distillery will pour at Localicious. 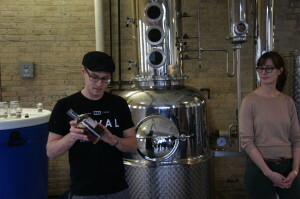 Here, Robert Birnecker describes Koval rye whiskey while wife and co-founder Sonat Birnecker Hart looks on during a distillery tour. Complementing these tastings will be creations from rising stars in the craft beverage world. Representing the city’s and region’s exponentially growing craft beer industry are Begyle, Forbidden Root and Greenstar breweries of Chicago and New Holland of Holland, Michigan, which also produces a line of brilliant craft spirits. They will be joined by distilleries such as Death’s Door of Middleton, Wisconsin; FEW Spirits of Evanston, Illinois; Journeyman of Three Oaks, Michigan; Koval, which was founded in 2008 as Chicago’s first distillery since Prohibition; and Rhine Hall distillery of Chicago, which specializes in fruit brandy. Also available to toast to Good Food are Lehman’s Orchard ciders from Michigan; Fenn Valley Winery of Michigan; Wollersheim Winery of Wisconsin; and Cello Via liqueurs. Craft soft beverages include NessAlla Kombucha and SenTEAmental Moods. Tickets for Localicious are on sale now, and you can make a nice savings if you buy in advance. Tickets purchased online are $80, and are $95 at the door. This entry was posted in Craft beverages, Farm to table dining, Food Artisans, Food Entrepreneurs, Good Food business development, Good Food Dining, Good Food Festivals, Good Food restaurant trends, Good Food Success Stories, Good Food tasting events, Local Food, Rooftop growing, Sustainable dining and tagged cider, craft beer, craft beverages, craft spirits, FamilyFarmed, Good Food Festival & Conference, Good Food tasting events, Localicious, Regional wine. Bookmark the permalink.